A pressure washer can be your best bud when it’s cleaning time. Helping you tackle a range of tasks in a short period of time is a big productivity boost. That includes reviving a tired, old wood deck that can take up less than 30 minutes of your time. But it’s very important that you are well versed on how to handle pressure washer as it can blast your wood deck, siding, fence or any wood surfaces into pieces if mishandled and it can also cause you serious bodily harm. Always stay safe! We’ve listed out the steps below to help you get that pressure washing done right and safely. Packing 30-80 times more pressure than an ordinary garden hose, pressure washers are responsible for thousands of injuries each year. So it’s a must that you take your safety a serious issue when working with one. Wear long pants, sturdy footwear, and eye goggles. Safety boots are also very important to protect your feet! Never operate a pressure washer without proper footwear. Remove all items from the deck especially breakables. Sweep away leaves and loose debris. Doing so will make tough stains left by mildew, tree sap and the like visible. Step 3. Apply a deck cleaner. Applying a deck cleaner will help loosen embedded dirt. You can skip this step if your deck is only slightly soiled though. Fill up the pressure washer soap dispenser with the cleanser. Be sure to follow the manufacturer’s instructions exactly. Generally, there’s no need to dilute the cleanser as the pressure washer will mix it up. Install the appropriate soap-dispensing nozzle onto the tip of the pressure washer wand. Power up the machine and using long overlapping sweeps, distribute the cleaner all over the deck. With a stiff scrub brush, work into tight corners and between railings. Don’t let the detergent dry to prevent streaking. Switch to the widest spray nozzle and begin pressure washing the deck. Move with the grain of the wood in wide sweeping motions. The nozzle should be about 2 feet away from the surface, but you can move closer as needed. However, don’t get any closer than 6 inches as you can damage the wood. After you’re done, turn the machine off and pull the trigger to release leftover pressure and drain the water line. 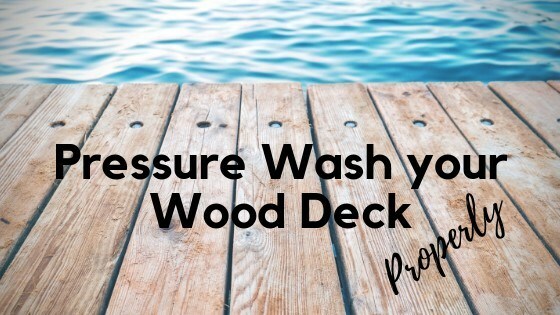 It might be time to apply a protective wood stain after you’re done cleaning your deck. Want to power wash your deck but don’t want to deal with the hassle? Let us do it for you! Give us a call and let’s get your wood deck ready for those early fall game-day cookouts!